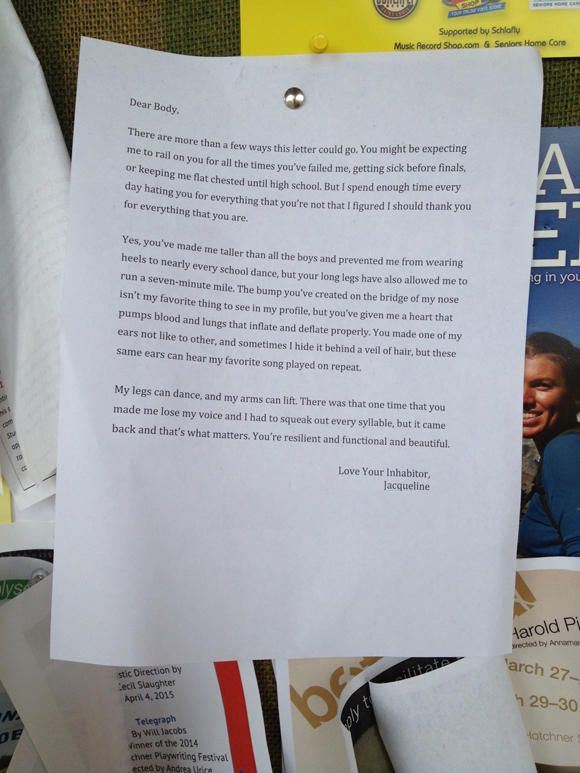 Leave a love letter in a public space. Did they contact you? As is always the case, if you do the task you get into the show for free. Leave proof in the comments below. $10 or free with a shared dish or a story in the comments below. We encourage you to come share your Love Letters at the live show! If you post a Love Letters story in the comments here, you get into the show for free. Here is my first public love letter. You shouldn’t be here; it is not your time. I’m going to tell you something that I know will help because it is what you need and want to hear. I love you and I care. I don’t know your name or story but I know this is not the place for you to be right now. You have a long life ahead of you that should not end like this. Life is not meant to be understood but lived. It is important to live out your life looking at every struggle as if it is something to conquer rather than something to escape. This park has been tainted with three suicides in the last two years. Families and friends are still grieving, by leaving letters and flowers. There is nothing else they can do, because someone that mattered to them is gone and can never come back. What I decided to do was give people like you another chance, another point of view. Take a minute to think about your friends, family, and significant other. Can you imagine how much you mean to them, what all they would do for you to make sure you do not go through with this tonight or ever? Whatever has brought you here should not keep you here. Think about that ray of hope someone gives you in your life that you would be giving up on if you go through with this. How will they react and how will they move on after hearing about what happened to you. If you can’t think of anyone right now, think about me. This letter is for you to let you know that I care about you and I love you enough to not want to see another story on the news. After this, think about me. If you’re ever in this mindset again, think about me still. Think about me forever, because I want you here to live out the rest of your life. Do that for me. I know you have the potential and strength to subdue whatever is hindering your life, don’t let it. There are more than a few ways this letter could go. You might be expecting me to rail on you for all the times you’ve failed me, getting sick before finals, or keeping me flat chested until high school. But I spend enough time every day hating you for everything that you’re not that I figured I should thank you for everything that you are. Yes, you’ve made me taller than all the boys and prevented me from wearing heels to nearly every school dance, but your long legs have also allowed me to run a seven-minute mile. The bump you’ve created on the bridge of my nose isn’t my favorite thing to see in my profile, but you’ve given me a heart that pumps blood and lungs that inflate and deflate properly. You made one of my ears not like to other, and sometimes I hide it behind a veil of hair, but these same ears can hear my favorite song played on repeat. My legs can dance, and my arms can lift. There was that one time that you made me lose my voice and I had to squeak out every syllable, but it came back and that’s what matters. You’re resilient and functional and beautiful. I don’t know you (or maybe I do), and you don’t know me (or do you?). But I felt compelled to write a little “love note” to you — For one, April was National Letter-Writing Month (so, as usual, I’m a little late) and for two, I’m hoping that some Higher Power is guiding my words and choice of placement — and your serendipitous discovery of this paper — for a reason. While I may not have known, at the time of this writing, whose hands this letter would fall into — You are in my thoughts and prayers. And these few minutes it takes me to write this letter are dedicated to you, in hopes that reading this will bring a small ray of happiness to your day. I hope (and pray) that your Higher Power, as you understand It, reveals Itself to you, that you may be more aware of Its presence (for It is always with you) and that the loving peace of your Higher Power fills your heart. May your eyes, your ears, and your heart be open to your Higher Power — that you may live to shine as you are meant to. Keep this letter (or pass it on!) and write one of your own to spread another moment of happiness. I just wanted to let you know, while you’re out on your (walk / run / frantic fleeing from the undead), that you have the most (beautiful face / curvaceous shoulders / delectable (de/a)ttached earlobes). And it’s not just your rockin’ bod that has inspired me to take pen to paper, it’s your (unlimited knowledge of French Monarchs / memorization of pi to the 18th place / memory of shark attacks along the Florida coast). It’s because of all these qualities that I can look over your (deep fear of peach cobbler / origami obsession (our house has become a veritable paper jungle) / tendency to carve your initials into the kitchen table). So please never (leave me / cut you hair / move to Albania), it would just be too much. [Left at the intersection of Kedzie and Lawrence). I did something cheesy and searched for “Where to Post a Public Love Note”, in the hopes that you, like me, would stumble upon some work that was written, composed, for you. What are the chances you’d come across this? The possibility is so close to zero I don’t even want to dampen my spirits by writing it down. I don’t even know what number to write down. I want to say I’m sorry — I’d love to say you’re just one of those statistics scratched on anyone’s bed post. But you’re not. You are nearer to a heart that will probably ask itself what the hell it was doing when it said to give up, for a long time. I want to say you will always be missed (and “always” I don’t use often). I am happy you found love again; I am sad you found love again. I still wish you all the best, with every (decent) part of me.